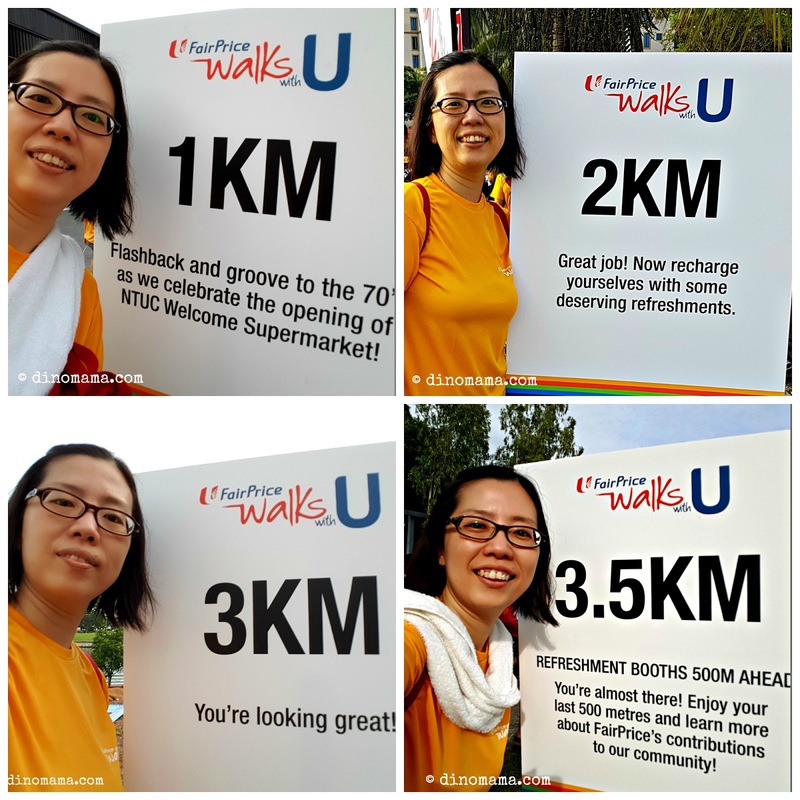 On 14 May 2016, NTUC FairPrice (FairPrice)’s signature walking event, ‘FairPrice Walks With U’, returned for the fourth year to bring multi-generational families and the community together, promote healthy and active lifestyles, and raise awareness for the less fortunate. 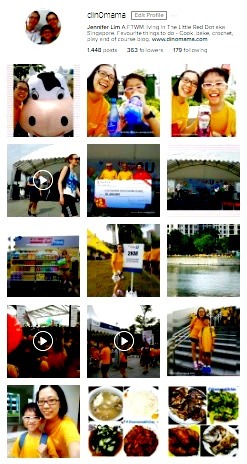 The event was attended by a record 8,000 participants and over 200 FairPrice staff participants and staff volunteers. 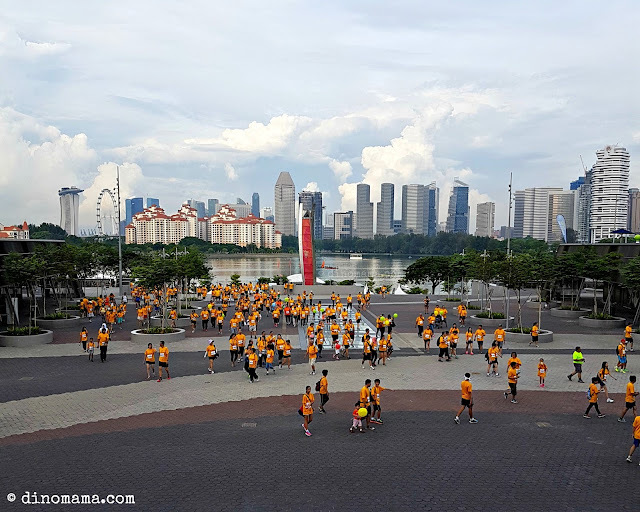 We were proud to be part of this significant event that was held at Singapore Sports Hub which is easily accessible via all transport modes. That morning, we woke up real early, had a good breakfast and make our way down. Like many of the participants we took a train and less than an hour later we alighted at Stadium MRT, came out of the station and right into the carnival. There were many games, drinks & snacks stalls by the various sponsors in the carnival. We walked around taking photos and DinoBoy tried to catch some thieves with some hola-hoops. This may look like an easy game but after watching a few kids and adults I think it is not as the hola-hoops are difficult to control. Try aiming and throwing these huge rings at the same time, its's challenging lah! One grandma gave tips to DinoBoy on how to score, look at the boy's serious face as he was concentrating on grandma's instructions. And he scored!!! Not all but 4 out of 5, not bad. Love the grandma who is so enthusiastic in guiding him and her encouragement throughout the short 38secs of play. 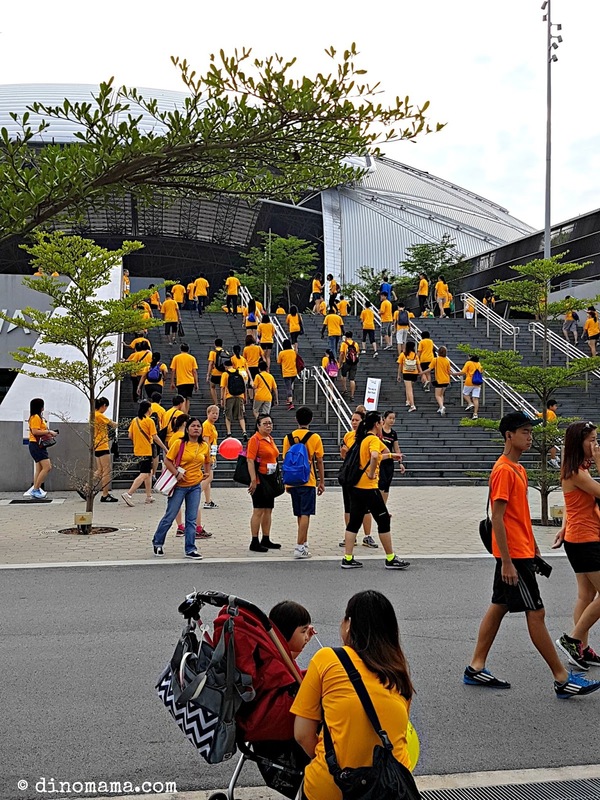 After a while we ended up at the Stadium Riverside Walk but the starting point for the walk was at 100PLUS Promenade (Gate 3), thus we have to make our long climb up the stairs towards it. A photo before the start of ascend on the stairs in our Skechers shoes. We made a slow way up the stairs and towards Gate 3 and managed to be near the starting point. It was a hot morning and every one tried to beat the sweltering heat by fanning themselves with their towels, fans or anything they could lay their hands on to keep cool. My tee was soaked with my perspire even before I start the walk! Luckily we did not have to wait long before the Guest-of-Honour, Mr Masagos Zulkifli, Minister for the Environment & Water Resources and FairPrice Chairman, Mr Bobby Chin flagged off the walk. If you followed my instagram, you would have know that DinoBoy "ditched" me and went off by himself. This is the ONLY photo I have of him with me! And its true, 30secs into the walk I lost the boy, how can a child walk so fast!??? Anyway, I was telling Mama Sue that with the boy not by my side, I can more leisurely, enjoy the scenery and take loads of photos. This is also the first time I take so many selfies. 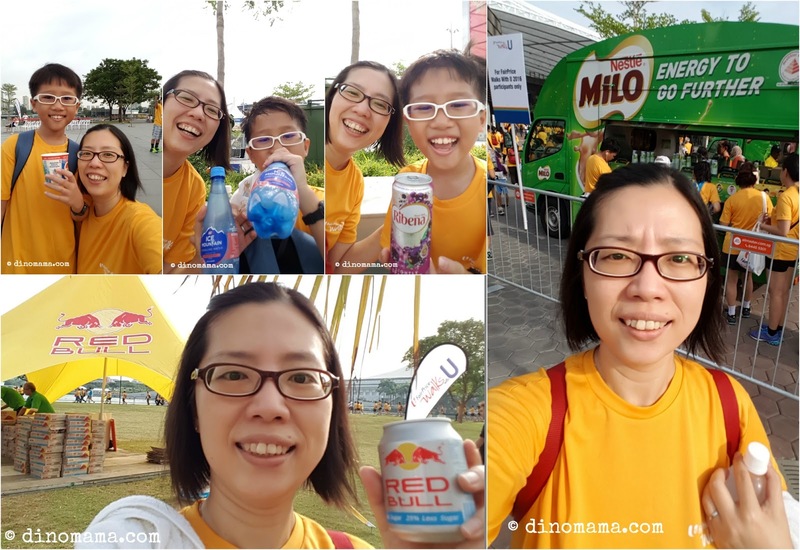 And because it is a non competitive event, I could take my time to wait for my turn to pose for a selfie at each distance mark, making my way steadily and slowly all the way to 4km mark. Half an hour later I found the boy near our agreed meeting place, sitting under the hot scorching sun watching some people playing volley ball in a sand pit. He was perspiring and I was glad that he had a half bottle 100plus with him to keep himself hydrate. 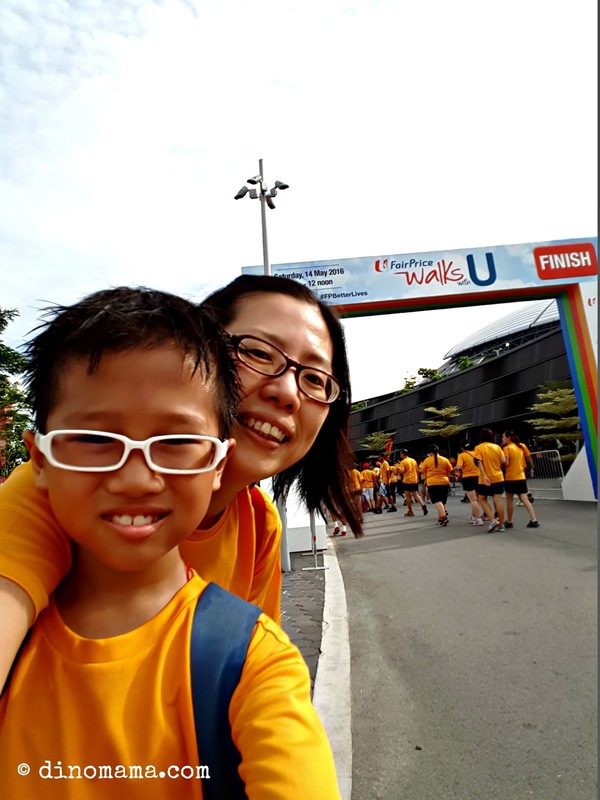 A quick welfie and off we go to strike a pose in front of the finish line. Yes! We did it! Our FIRST Family Walk; even though we did not walk together, but nonetheless a new family bonding event added to our list. Maybe at our next walkaton we shall make it more interesting by brisk walking throughout the entire route, that will probably make me keep up with the boy and not lose sight of him. And I can safely declare that my selfie skill has improved quite a bit, thanks to the numerours selfies I took within the short span of few hours. The weather has not been very forgiving recently and I am glad that the organisors made sure that there were plenty of water points throughout the route for the participants to hydrate themselves. We were spoil for choices too, there were 100plus, Ice Mountain, Ribena, Milo, Red Bull, Magnolia milk, Vitagen and Ensure milk too. I hope I have not missed out any sponsors. Later DinoBoy went off to the carnival by himself. He said he played Jumbo Rubik’s Cube, Mega Tetris and Ultimate Pick-Up Sticks, even went back to catch some more thieves. At the same time I was relaxing in front of the centre stage being entertained by the several artists. One of the highlight was the performance by the Silver Strings, a home grown band that rocked the 60s back then. I vaguely remember this group perhaps from the tv appearances they did when I was a little girl. For the benefits of those who are unfamiliar with them, read about them over here. This band definitely created a storm back in the 60s and I tell you, their charm did not fade and you can see many of their fans among the audience that day. Most of them may be the Pioneer Generations but they still show their love and support to this band. Check out the instavideos I posted in my instagram showing 3 pairs of dancers dancing to their tune. 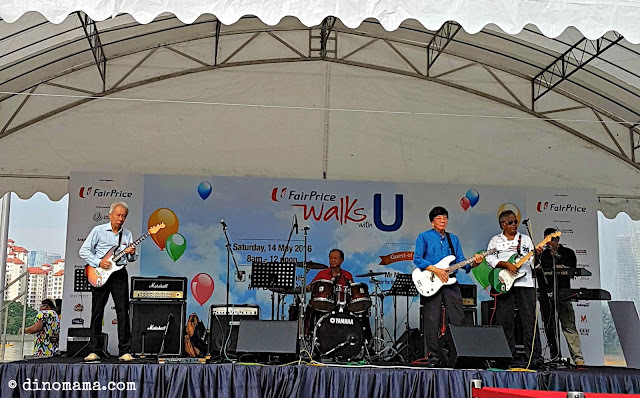 Check out the day's update by one of the band's original singer Andy Young - Silver Strings @ Kallang Wave Mall. There are 2 videos of their performance on that day but it does not do justice to them because they were way much better than that! This event had a couple of achievements, the first being getting into the Singapore Book of Records for attaining the most number of Instagram posts with #fairpricewalk in the span of four hours. 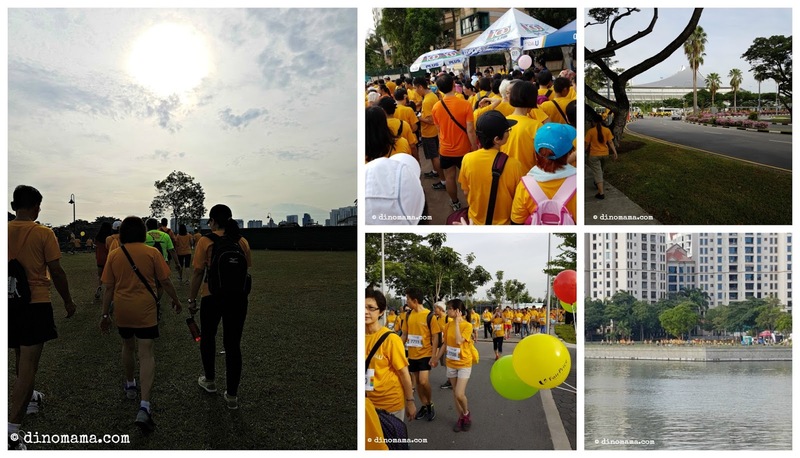 Participants at the event achieved this feat through garnering 1,199 Instagram posts within the time period, beating the previous record of 1,111 posts. Look at our contributions to the 1,199 instagram posts hehehe~ I was telling DinoPapa that I have NEVER post so many instagram photos and videos at an event within a few hours! 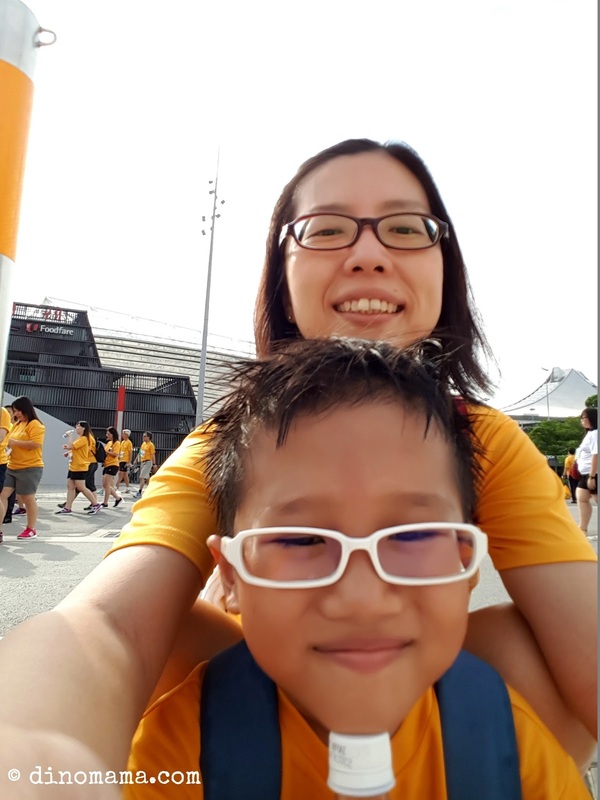 As part of efforts to give back to the poor and needy in the community, FairPrice Foundation pledged to donate $150 to charity for every event ticket sold with each ticket, priced between $10 and $15. 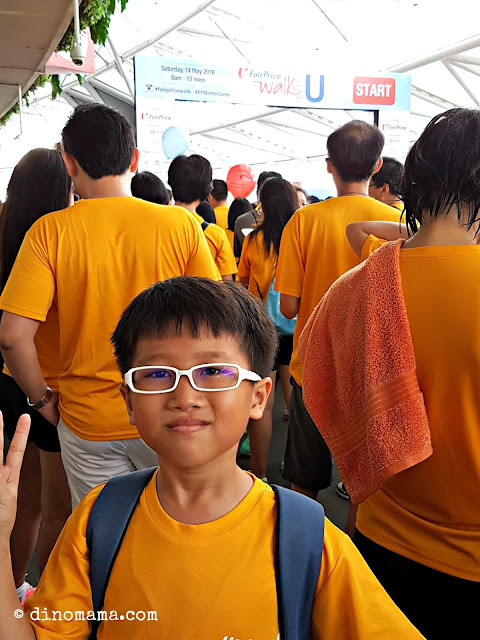 The event was fully subscribed with 8,000 participants, and a total of $1.2 million will be donated to help low-income families through the FairPrice Food Voucher Scheme. What a great achievement! 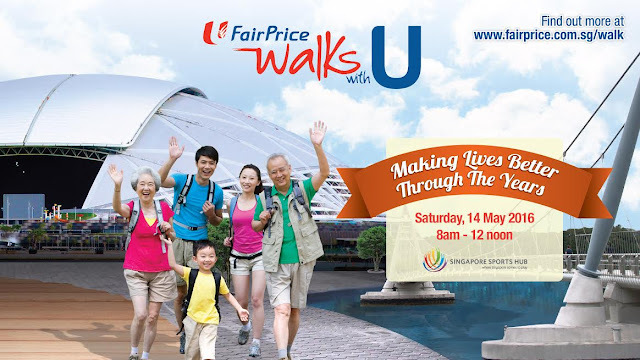 At the event, FairPrice also renewed its social commitment through a new tagline, Here to Make Lives Better. This follows a brand refresh exercise which looks to effectively communicate its social goals through four main message pillars – Making every day better, Giving back for the better, Better for our planet and A better place to work. Even though I did not walk the whole carnival nor stop to play any games, I enjoyed myself thoroughly and I can speak for DinoBoy that he did too. The sun was unbearable but the atmosphere was great, most participants was not in a hurry to leave once they finished the walk. They stayed around either at the carnival or like me, sat in front of the stage listening and crooning to the songs sang by the various artists. Well, if you think walking is easier than running, you are wrong as both requires strength and perseverance to finish the route. Proper shoes is a must too. 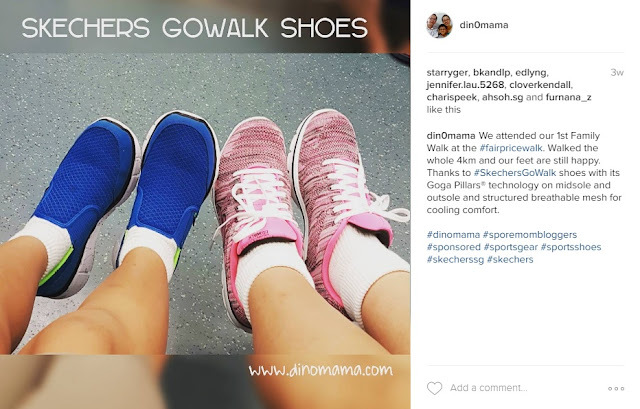 We are sure glad that we have our Skechers GoWalk shoes. 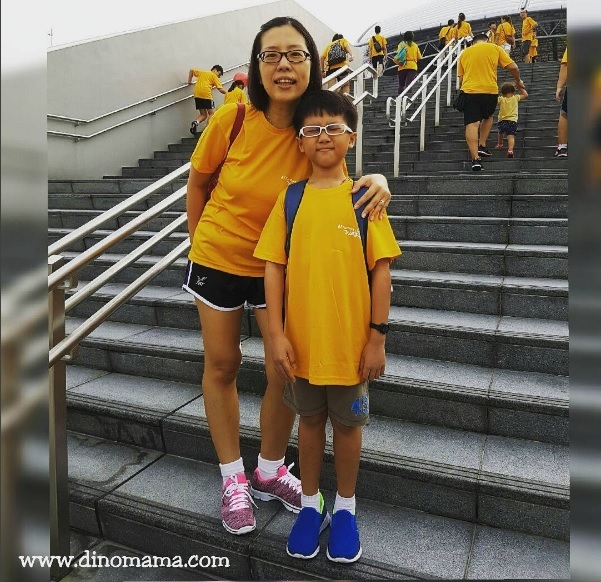 DinoBoy wears the Skechers Equalizer series slipped on shoes that has their signature Gel Infused Memory Foam cushioned comfort insole, FlexSole shock absorbing flexible lightweight midsole with Flexible traction outsole. It feels so light eight and comfortable even after his 4km run. Both shoes are so lightweight that we do not feel any added weigh on our feet, these are the best shoes for long distance trekking, hiking or walks. We had such a great time, we hope to be back again next year! Disclaimer : We were given complimentary tickets to attend the Fairprice Walks with U 2016. We were not required to write about it but decided to do so because we had such a great time! Skechers Singapore has generously sponsored a pair of shoes each to DinoBoy and myself for the event. 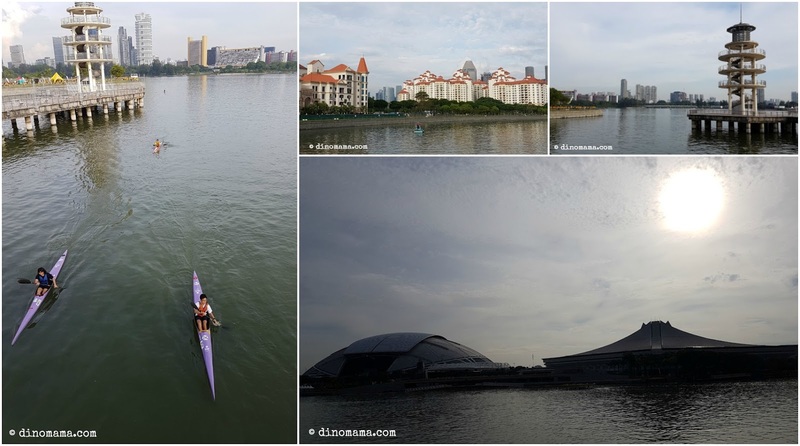 All opinions are 100%, the photos and videos in this post belongs to The DinoFamily, please seek permission to for your own use.